What is fructose? It’s the major carbohydrate present in fruit, and although dietary fructose is derived from fruit, most of it comes in the form of sucrose – commonly known as ‘sugar’ – and from foods containing added sucrose. This is because sucrose consists of 50% fructose and 50% glucose. 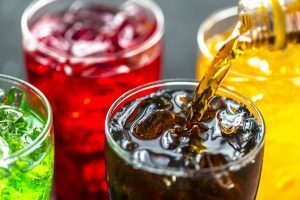 Sweet foods such as desserts, cakes, chocolate and other confectionery, and sweetened beverages such as carbonated soft drinks, sports drinks and so on, have large amounts of added fructose. High fructose corn syrup is a big problem also as it is added to many packaged foods. Fruit juice is also very high in fructose, and continues no fibreto help absorb it. A normal healthy adult can properly digest 25-50 grams of fructose per day. Many people have difficulty digesting less than that, and a few of us have difficulty digesting any fructose at all. Why? Are apples really the problem? Has too much honey contributed the massive increase in gut problems. Why is it we are happy to eat highly processed low carb, low fat, high protein bars, yet we’re afraid of bananas? Stay tuned?